2017-04-23 ~ National Association of Postal Employees, Tirunelveli Division. As on date, there are no orders keeping the Cadre Restructuring orders in abeyance. Circles are reported in the process of identifying the posts and convening the DPCs. NAPE Group C discussed with the Department today (28.04.2017) also and submitted letter. Hats Off to Shri.Kishan Raoji and others. ஒரு வட்டத்துக்கு ஒரு PMG என்ற நிலை மாறி இன்று 5 PMG ஒரு CPMG வரை சென்றனர் என்றால் ஒரு DG இரண்டு DG ஆனார்கள் என்றால் கடந்த முப்பது வருடங்களில் 5 Cadre Restructuring அதிகாரிகளுக்கு நிறைவேற்றப் பட்டதால் தான் என்பதை மறந்து. நமது எதிர் கால சந்ததியினர் உயர வேண்டும் என்பதை விடுத்து 30 வருடங்களுக்கு பிறகு கஷ்டப்பட்டு Gr. C க்கு வந்த Cadre Restructure ரை எப்படிடா கிடப்பில் போட முடியும் என்று முயலும் மாற்று சங்கத்தின் தொடர் முயற்சிக்கு எதிராக இலாகாவின் வளர்ச்சி ஒன்றை முன்னிறுத்தி இந்த Cadre Restructure ல் சில குறைகள் இருந்தால் விரைந்து களைந்து இளைஞர்கள் முன்னேற வழிவகை செய்ய வேண்டும் என்ற நமது துறை இளைஞர்களின் விருப்பத்திற்கு இணைக்க செயல்படும் தேசிய சங்கத்தின் அகில இந்திய சங்கத்திற்கு நெல்லை கோட்டத்தின் சார்பாக வீர வாழ்த்துக்கள் உரித்தாகட்டும். இன்று 29.04.2017 அன்று பணி ஓய்வு பெறும் நமது தேசிய சங்க உறுப்பினர் ஹாஜி. 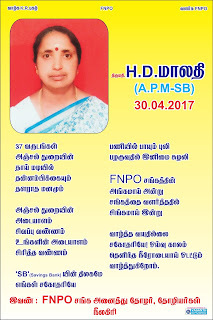 அஹமது ஷெரிப் அவர்கள் (Postal Assistant, Tirunelveli HO) எல்லா வளமும் பெற்று தனது ஓய்வு காலத்தை மன அமைதியுடனும் நிம்மதியுடனும் வாழ எல்லா வல்ல அல்லாஹ்வின் அருளாசி அமைந்திட வேண்டுகிறோம். இன்று 29.04.2017 அன்று பணி ஓய்வு பெறும் நமது தேசிய சங்க பற்றாளர் திருமதி சுந்தரமணி அவர்கள் (Asst Postmaster SB, Chennai GPO) எல்லா வளமும் பெற்று தனது ஓய்வு காலத்தை மன அமைதியுடனும் நிம்மதியுடனும் வாழ எல்லா வல்ல இறைவன் அருளாசி அமைந்திட வேண்டுகிறோம். A tripartite Memorandum of Understanding has been signed today among BBNL, Department of Posts and BSNL for providing broadband connectivity of BharatNet to Post Offices in rural areas. The MoU signed under the chairmanship of Minister of Communications Shri Manoj Sinha is the first tri-partite agreement to provide broadband connectivity to about 1.3 lakh, post offices in rural areas and 25,000 sub-post offices for high speed internet connectivity to the rural masses. Speaking on the occasion, Shri Sinha said that the first phase of connecting about one lakh Gram Panchayats is nearing its completion and in the remaining one and a half lakh Gram Panchayats 100 mbps broadband connectivity will be completed by December, 2018. In reply to a question, the Minister said that BharatNet is one of the 9 pillars of realising the Prime Minister’s vision of Digital India. Shri Sinha said that provision of citizen services is the focus of BharatNet and in the agreement signed today, BSNL is the service provider, that would provide broadband services, the cost of setting up of infrastructure and the operational expenses would be paid by the Department of Posts. Since the BharatNet is the National Network, BBNL would facilitate and coordinate this entire operation. In future, MoUs with other Government Departments are also proposed to be signed. NAPE Group 'C' Letter to Secretary ,DoP on various issues. 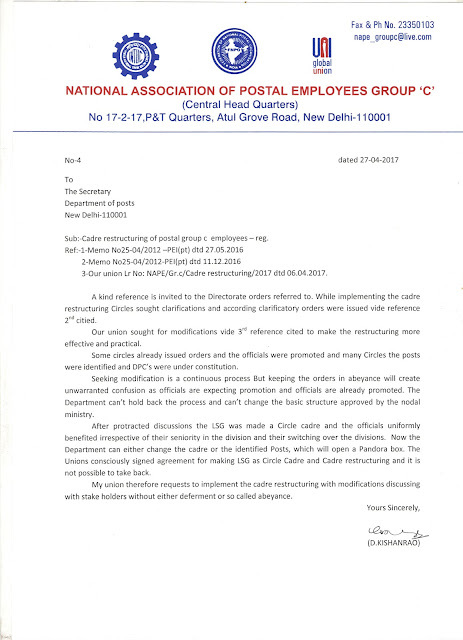 National Association of Postal Employees Group 'C' Letter to Secretary ,DoP Dated 27.4.2017 : Cadre Restructuring of Postal Employees Group 'C' - Reg. 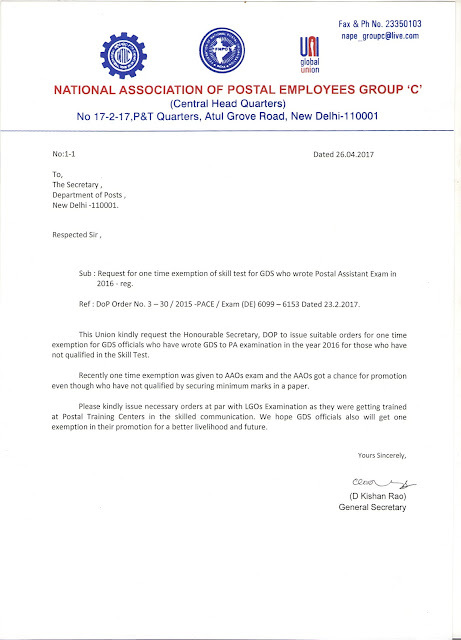 NAPE Group 'C ' request Letter to Secretary , DoP : One time exemption to Skill Test for GDS who wrote Postal Assistant Exam in 2016. Department of Posts has revamped the existing compassionate engagement scheme offered to the dependent family members of Gramin Dak Sevak. A GDS who dies in harness, the dependents of such GDS will benefit from a liberalised and time bound procedure for engagement on compassionate grounds. Henceforth, any death of a Gramin Dak Sevak while on engagement would be compensated by a compassionate engagement to a dependent family member irrespective of the circumstances or indigence. Upper age limit of the applicant could also be relaxed wherever found to be necessary. Thus the new scheme of compassionate engagement will provide greater relief to the members of the family of the deceased GDS who belong to weaker and poorer sections of the society and are thrown into penury and hardship. •Daughter in law of the deceased GDS who is wholly dependent on the GDS, if the only son of the GDS is predeceased. This expansion of the definition of family members aims to bring greater relief to women in our society who are subjected to difficult circumstances in the unfortunate event of the demise of their spouse/parent. The present system of relative merit points to ascertain the degree of indigence has been dispensed with. Keeping in view the unique and distinct service conditions, socio-economic aspects and to relieve the family from financial destitution, the time-consuming process of consideration by Circle Relaxation Committee has been done away with. Henceforth, a request received for compassionate engagement would be considered and decided within three months from the date of receipt of the application. Further to ensure the least displacement, it has been decided that to the extent possible, compassionate engagement would be offered to the dependent of the deceased GDS, to a GDS post near the place where the family of the deceased normally resides. Our Chairman, Postal Board, Shri. B. V. Sudhakar is retiring from Service today on superannuation. During his period, he has done a lot of the downtrodden GDS employees of our Department. His contribution towards the improvement of GDS employees is marvellous and ever rememberable. He has also helped other Postal employees also in many ways. FNPO always remember the Officers who have worked for the welfare of the employees. Our Federation prays the ALMIGHTY to shower his choicest blessings towards Shri. B.V.Sudhakar and his family members. 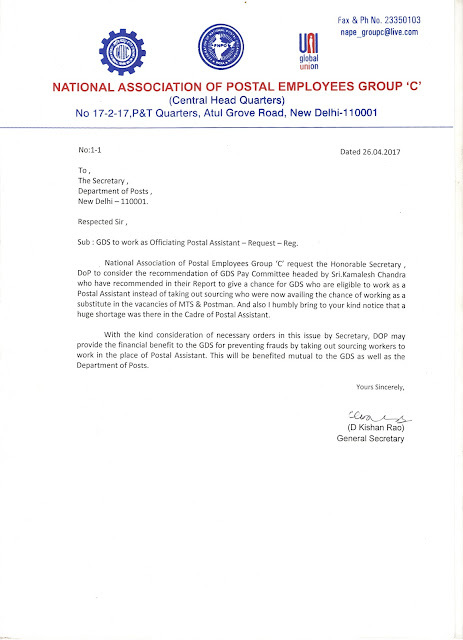 The National Association of Postal Employees Group-c appeals to all unions and federations regarding ‘Removal of 3 -A (i) of GDS Conduct & Engagement Rules,2011. My Federation and its affiliated unions, including NUGDS, warmly welcome all other unions for discussion regarding report given by Chairman, Sri.Kamalesh Chandra. My Federation wholeheartedly appreciates on the welfare measures which were recommended by the Committee and welcome some amendments which were taken into consideration from the memorandums submitted by FNPO & NAPE GR-C.
At the same time, we also object on the issues which were not taken into consideration where the issues which could play a major part in the life of GDS. My Federation strongly oppose for non-implementing of Rule 3-A (i) as it is so transparent to the Postal Department that the GDS are working beyond this rule for more than 8 hours which was not taken into account by the Committee for the removal of this cap. This is very unconstitutional and against Natural Justice in the recommendations given by the GDS Pay Committee. The Committee is directly or indirectly having clear idea of the effect of rule 3-A (I) on GDS officials and has clearly expressed that the Department has to take the stand on the removal of 3-A(i) and not given any recommendation on it as it is the rule framed by the Department of Posts. No Judicial authority will intervene if that rule is removed by the Department of Posts, by doing so never it will be termed as subjudice. 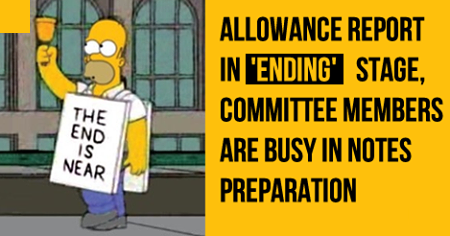 If the Department would have done it much before GDS Pay Committee by including in the terms of reference, the Committee would have recommended full working hours i.e., 7 hours 30 mints as it is visible from the inside of the Committee report. At this juncture considering our demand of withdrawal of income and cost the revenue generation is introduced. By the present standards, revenue generation is given for jumping one level to another and getting allowances beyond level 2 the chances are remote. It’s practically not possible with present standards of remuneration such as Rs.64/- as B.O. 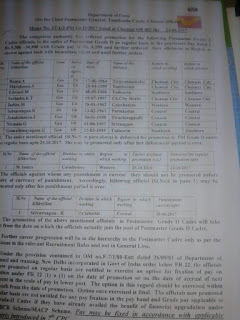 share out of Rs.205/- in respect of POSB. If same percentages are fixed at B.O. level in forthcoming India Post Payment Bank and Rural Communication and Information Technology, how the BPM at the second level will cross the benchmark of Rs.36, 000/- in revenue generation. Hence it is felt by this Federation it is the apt time to join hands by all Federations and GDS Unions for the achievement of the above said recommendations which were framed by this union by forming a Forum to protest till we achieve our legitimate demand. Rule 3 A(1) of the Gramin Dak Sevaks (Conduct and Engagement) Rules 2011 specifically says that a GDS should not be asked to work for more than 5 hours a day. Therefore GDS committee report submitted by Shri Kamalesh Chandra also has not imagined a case in which GDS will have to work beyond 5 hours, and the wage structure is also framed accordingly. But the fact remains that in many circles, there are Branch Offices where GDS BPM’s have to work for even beyond 8 hours! If the case is taken up legally, the result will be adverse as there is no case in which GDS official’s working hours are fixed beyond 5 hours. The following suggestions are offered. 2) T o replace the recommendations of Shri Kamalesh Chandra to provide additional wages to those GDS BPM’s who are working for more than 5hours with full working hours up to 7 hours 30 mints. 2.General Secretary, AIGDSU (CHQ), First Floor, Post Office building, Padmanagar Delhi -110007. 5.The General Secretary, BPEGDSU, C/o BPEF, Atul Grove Road, New Delhi-1. கேடர் ரீ ஸ்ட்ரக்சரை எந்த வழியில் எல்லாம் கிடப்பில் போட முடியும் என்பதை விடுத்து நமது எதிர் கால சந்ததியினர் உயர வேண்டும் என்பதை முன்னிறுத்தி இந்த கேடர் ரீஸ்ட்ரக்சரில் சில குறைகள் இருந்தால் விரைந்து களைந்து இளைஞர்கள் முன்னேற வழிவிடுங்கள். ஒரு வட்டத்துக்கு ஒரு PMG என்ற நிலை மாறி இன்று 5 PMG ஒரு CPMG வரை சென்றனர் என்றால் ஒரு DG இரண்டு DG ஆனார்கள் என்றால் கடந்த முப்பது வருடங்களில் 5 கேடர் ரீஸ்ட்ரக்சர் அதிகாரிகளுக்கு நிறைவேற்றப் பட்டதால் தான். Meeting with Secretary, Department of Posts Today ( 26.04.2017 )a team from FNPO/ NAPE Group C Sri D.Kishanrao, GS along with Asst. Secretary Generals Sri B.Shivakumar and Sri Sivaji Vasireddy met Sri BV Sudhakar, Secretary and Chairman Postal Board and discussed the following problems. 1.Cadre restructuring : The NUPE, Group C already sought for modifications on 6.4.2017 for implementation of cadre restructuring. We opposed any deferment or abeyance of orders which will create frustration among the Group-c cadre. We also opposed the divisionalisation of LSG and HSG II. The base for the restructuring in Group-c is up gradation of C&B class offices which was approved by the nodal ministries and any deviation will affect the restructuring itself. There are no orders so far in regard to deferment or abeyance. It is the Secretary assured to settle the issues within 30 days. 2. The NAPE Group-c opposed the draft Revised Recruitment rules for AAO’s as per our letter dated 20.04.2017. Any modification to the RR will affect the cadre drastically. 3. On GDS issues two letters submitted for one time exemption of skill test for GDS who wrote PA examination in 2016. 4. It is also requested to allow the GDS employees to work as PA’s in the clear vacancies like MTS and Postman. The response was positive. It is also informed orders are under issue in regard to compassionate appointment of GDS without any point system and adding more dependents like widow daughter and married son. Cadre Restructuring & GDS Issues latest. Today we discussed the matter with the officers in the Directorate. According to our information, the Directorate is going to form a committee to review the order of cadre restructuring after obtaining the views of the Heads of Circle. FNPO & NAPE-C strongly feel that some modifications required in the present cadre restructuring order at the same time keeping the orders in abeyance will create the unnecessary delay to get the promotion of the staff. We are seeking the appointment of Secretary today after meeting the Chairman, we will post the outcome of our discussion on our website. GDS DA order will be issued shortly, in regard to the implementation of GDS Committee recommendation formalities will take at least 3 months time. The proposal of the implementation Committee is now being examined by the Joint Secretary & Financial Advisor (JS & FA) of the Postal Board. After JS & FA’s approval the proposal is to be approved by Secretary, Departmental of Posts. Then the file is to be submitted to the Minister, Communication for approval. Only after the approval of the Minister, Communications, the file will be submitted to Department of personnel & Training for approval and then the proposed is to be submitted to Finance Ministry and Law Ministry for approval. After completing all these process only the final proposal will be submitted to Cabinet for approval. This it can be seen that much delay is taking place in implementation of the favourbale recommendations of the GDS Committee Report. Eventhough Secretary, Department of Posts has informed that Postal Board will take speedy action for implementation, many hurdles including Finance Ministry’s approval are to be crossed yet. 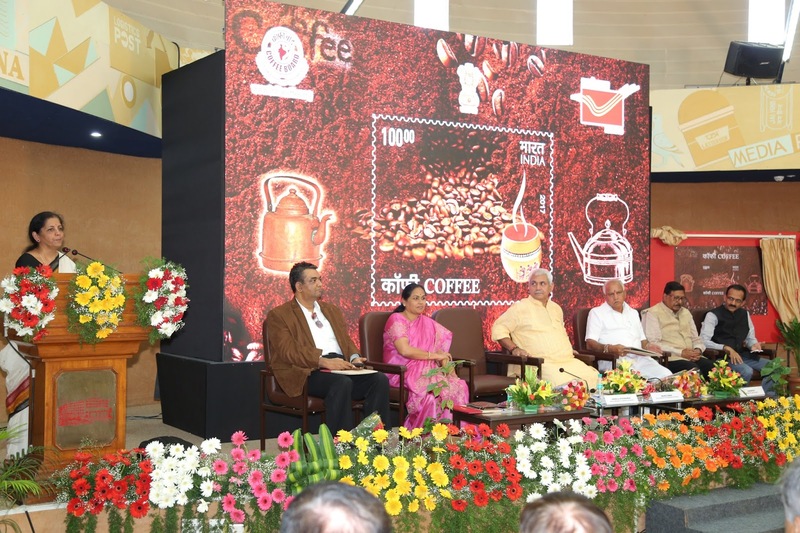 Union Minister Nirmala Sitharaman along with the Minister of State for Communications Manoj Sinha on Sunday released the scented postage stamp on coffee made by India Post Office. At an event organised by the India Post department in Bengaluru today, Sitharaman unveiled the stamp which is a collector’s version and is priced at Rs 100. On April 20, Sithraman took to Twitter and shared information about the launch of the coffee flavoured stamp. “#coffeeflavouredstamp release by @IndiaPostOffice on 23/4/17. @CoffeeboardI. Philatelic delight. Can smell the coffee now,here. #philately,” she twitted. NDTV Profit News : The 7th pay commission had examined a total of 196 existing allowances and recommended abolition of 51 allowances and subsuming of 37 allowances. 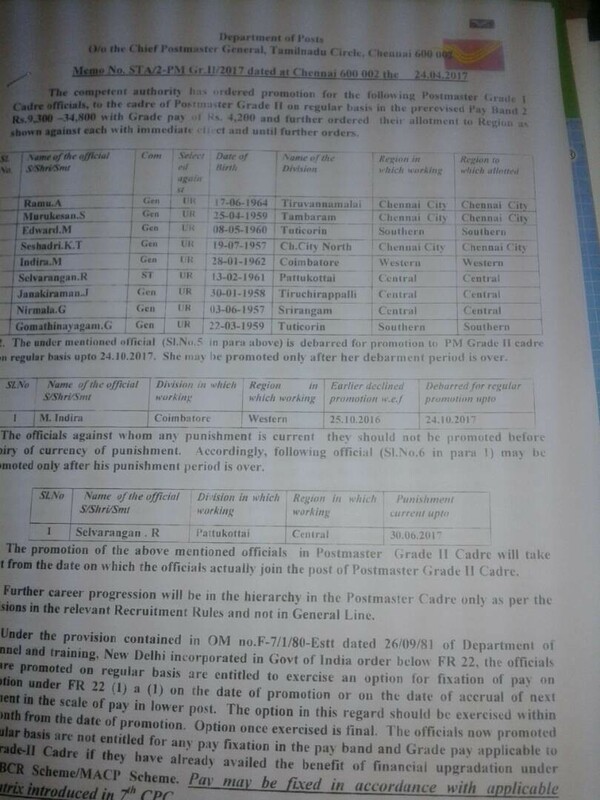 Postmaster cadre Promotions are under process at CO and is expected within the end of April 2017 or Ist week of May 2017.
a. One time relaxation for vacant Posts in Grade III to be filled up with officials who have completed 4 Years of service in Grade II. ஏப்ரல் மாத SSPOs உடனான மாதாந்திர பேட்டி வருகிற 26.04.2017 புதன் கிழமை காலை 1030 மணிக்கு நடைபெறும். தங்கள் பகுதியில் ஏதாவது குறைகள் இருப்பின் உடனடியாக தெரிய படுத்தவும்.